François Rabelais (ca. 1490-1553? ), Les Horribles et espovantables faictz et prouesses du très renommé Pantagruel, roy des Dipsodes, fils du grand géant Gargantua (The Horrible and Terrifying Deeds and Words of the Very Renowned Pantagruel King of the Dipsodes, Son of the Great Giant Gargantua). 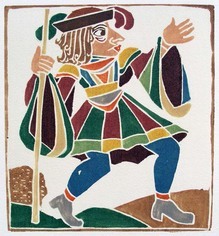 Orné de bois en couleurs dessinés et gravés par André Derain (Paris: Albert Skira, ). Copy 138 of 275. 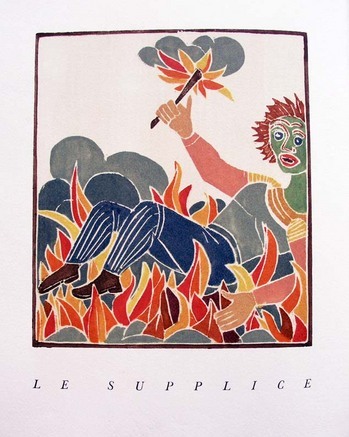 129 woodcuts designed and cut by André Derain (1880-1954). Graphic Arts Collection (GAX) Oversize 2006-0777Q. Purchased with funds from the Friends of the Princeton University Library. 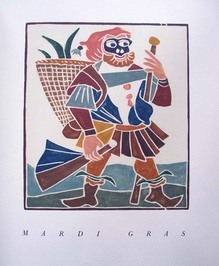 First published in 1532, Rare Books and Special Collections holds over 60 different editions of Rabelais’s satirical stories of Pantagruel and Gargantua. 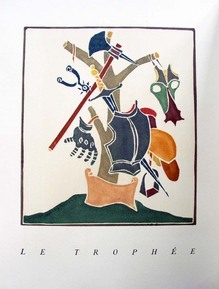 One of the most recent is the livre d’artiste illustrated with white line woodcuts by André Derain. As the initiator of Fauve painting, which stunned the world at the Salon d’Automne of 1905, Derain stood shoulder to shoulder with Henri Matisse (1869-1954). Derain received commissions for books with Daniel-Henry Kahnweiler and Paul Guillaume, and helped André Breton produce his first publication Mont de piété (1916). 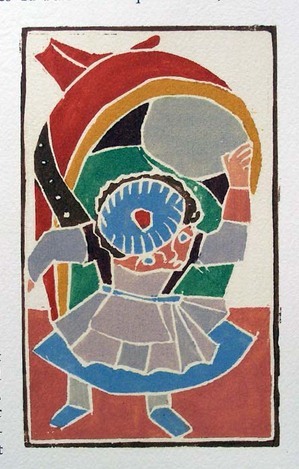 Derain also created designs for opera, theater, and ballet; most notably Diaghilev’s Le Boutique fantasque (1919). In 1921, Derain decided to mark the quatercentenary of the death of Raphael by spending time in Rome. 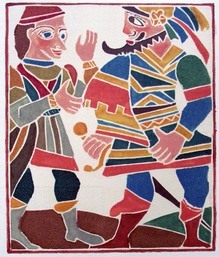 He traveled and studied Italian Renaissance art, medieval design, and Roman mosaics. When the Swiss publisher Skira offered him a commission to work on Pantagruel he accepted immediately. It was the perfect opportunity to find a way to combine high Renaissance and modern styles in a single volume. 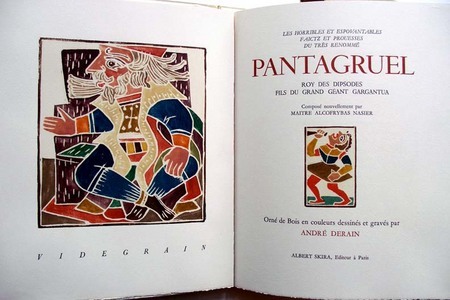 During World War II, when the Germans invaded France, Derain’s home was requisitioned and his preliminary blocks for Pantagruel were locked away for several years. Ultimately, he was allowed back into the house and somehow able to import the enormous amount of paper needed to print nearly 3,000 pages for the edition of 275 copies. 1943 is used for the publication date although no date is on the title page.